Prom, pups, and deadly murders? In the wake of her relationship’s break, Olivia is beginning to fear she might grow old with only Goodwin and a pack of dogs by her side. But even the unconditional love of puppies can’t shield Olivia from the single most important event in Lexingburg's social calendar: prom. The roses, romance, and ridiculously priced restaurants seem to be rubbing salt in Olivia’s romantic wounds - reminding her at every turn that Andrew is leaving her. While trying to shut the door on the mess of her relationship, Olivia accidentally opens the door to a murder investigation. Olivia’s friend, the owner of a boutique dog food brand, has been killed at her warehouse - bludgeoned with a side of beef. Olivia tries to run off her emotions but only stumbles upon the main murder suspect acting suspicious. She sees this as a sign. If she can’t solve her romantic problems, she can solve the murder of her good friend. Now, Olivia finds herself in an ever more tangled web of lies, secrets, and jealousy, both recent and decades old. Who knew dog food could cause as much drama as a high school dance? No bark nor bite in this pleasant cozy! This is the third book in the Happy Tails Dog Walking mystery series but my first book in the series, so I am reading them out of order. I did not have any difficulty figuring out what happened in the previous books, in particular the main character Olivia's breakup with her fiance Andrew. I enjoyed Olivia and the supporting characters, including the dogs. I love dog mysteries and some of Olivia's dog clients have funny antics. This particular story has Olivia discovering the dead body of the owner where she purchases dog food. There seems be several other mini plots in the mystery including Olivia helping out with the local prom. It was fun to reminisce with Olivia as she recalled her prom days. Olivia also renovates the building with her sister Janelle to increase their income. Both have absolutely no experience with dry-walling nor renovations so it's a miracle they pulled this off. Olivia also struggles with her feelings with her ex-fiance, which I understand they broke up in the last book. It will be interesting to see what direction their relationship takes. I listened to this book on audio, narrated by Machelle Williams. I have to admit in the almost 5 hours of listening that I never grew to like Machelle's voice. Although she had good pace, pauses in the proper places, and appropriate characterization, I didn't care for the tonal quality of her voice. It seemed rather raspy and a more on the alto scale. I prefer lighter, clear voices more on the soprano scale for cozy mysteries. Perhaps I will go back and read the first 2 books in ebook rather than audio. I would like to thank the author for receiving this audiobook from the publisher in exchange for an unbiased review. Looking Forward to Book 4! There are no spoilers in my review. I listened to the second book and loved that one, so I was excited to read this one. The author didn't disappoint, I found it just as much fun as the last one and I am now looking forward to the fourth book. The narrator does a wonderful job with the acting and telling of the story and is a delight to listen to. I great clean mystery and romance in one! These books are souch fun! This is one series where I'm always anxiously awaiting the next book. I can't get enough! I was voluntarily provided this free review copy audiobook by the author, narrator, or publisher. Really enjoyed this light, cozy mystery. Can't wait for more in this series. This is book 3 in the Happy Tails Dog Walking Series. I thought this book was light and entertaining. I liked that Andrew had less of a presence in this book. I did think the book was more enjoyable then book 2. Machelle Williams is the narrator and she also narrated book 1 and 2. She does a wonderful job. For me she kept me listening. I was gifted this audiobook with the understanding that I would leave an honest review. I was voluntarily provided this free review copy audiobook by the author, and found it very entertaining. The characters are very interesting and well written. Olivia's life is still in chaos since Andrew wanted some space. So she keeps busy, with her business and helping out with the prom. Her friend is found murdered and she tries not to help solve it, but Olivia just can't seem to help herself. Humour and suspense fill this delightful book. Looking forward to book 4. 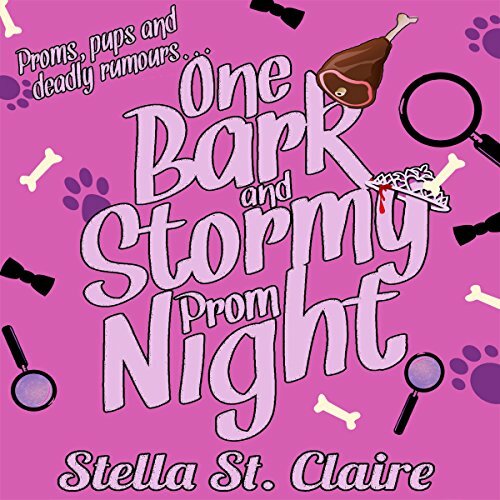 I so enjoy this series by Stella St. Claire. Olivia and Andrew are endearing characters that are meant for each other. Machelle Williams does such a great job with putting her emotions into the characters. I like it when the crime is solved in a book. Olivia, a dog walker, has a panache for finding dead bodies and gets involved with solving their crimes. I liked the unexpected twists in this book. I requested this review copy audiobook and have voluntarily written this review. I will definitely listen to more books by this author and narrator.